A skull etched on the lid of Intel's new NUC6i7KYK mini-desktop is a dead giveaway that this tiny PC is targeted at gamers. 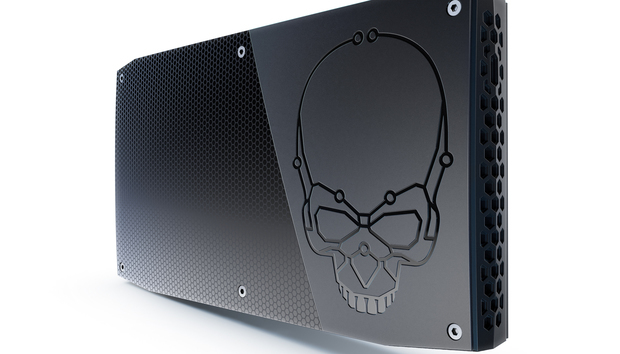 The pint-sized NUC -- code-named Skull Canyon -- can be held in one hand, and is the fastest NUC yet from Intel. External graphics cards can be attached to the PC to boost gaming performance. The NUC starts at $650. A $999 unit has 16GB of memory, a 256GB SSD and Windows 10. The PC can be ordered through Newegg.com starting in April, and shipments will begin in May. It has a sixth generation Intel Core i7-6770HQ processor, code-named Skylake, that draws 45 watts of power. By default, it has an integrated Iris Pro 580 integrated graphics processor, which sits on the top rung of Intel's GPUs. Intel believes its highest-performing Iris Pro GPUs can outperform about 80 percent of discrete graphics cards. But Iris Pro won't be enough for intense gamers, and a powerful external graphics card can be hooked up to the PC through a Thunderbolt 3 port. An external graphics card can be placed in an enclosure from Razer called Razer Core, then hooked up to the NUC. The NUC supports up to 32GB of DDR4 memory. It has two m.2 slots for SSD storage via the SATA3 or NVMe protocols. It also has a micro-SD slot for expandable storage. It has a USB Type-C port that supports the Thunderbolt 3 and DisplayPort protocols. Up to three 4K monitors can be hooked up to the PC. It also has four USB 3.0 ports. Other features include Gigabit ethernet, dual-band 802.11ac Wi-Fi, a full-sized HDMI 2.0 port and Bluetooth 4.2 support.